Every now and then, we come across a special adoptable pet who needs a little extra help finding a home. 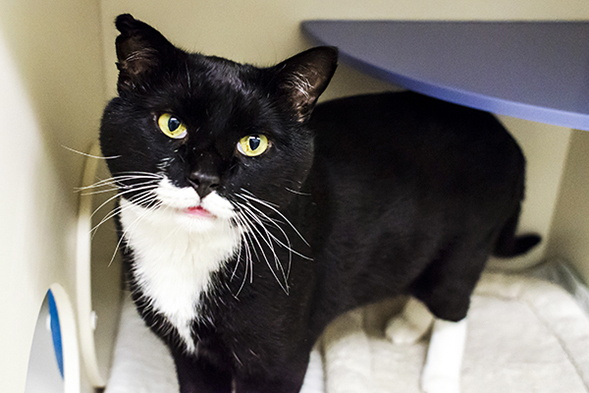 This week, we’re shining our Adoption Spotlight on Ronny, a special cat who will make one lucky adopter very happy. Ronny came into the ASPCA’s care in October 2013. When this sensitive guy first entered the ASPCA Animal Hospital, he was very nervous and had several health conditions requiring medical and dental care. In fact, Ronny was so anemic that he required a blood transfusion. But even while he was very sick, it didn’t take long for his sweet and loveable personality to shine through. Ronny loves his special food and will do just about anything for a snack—he’s even learning some cool tricks such as jumping on stools and sitting on command. Ronny’s a fast learner, and he’d love to have you teach him a few more tricks. This resilient guy prefers to have all four paws on the ground, but shows his affection with plenty of chirping and leg rubbing. He loves attention and being stroked by his favorite people! Ronny’s the kind of cat who can get along with everyone, and with the right introductions, we think he’ll become fast friends with your resident dog or cat. This sweet boy is FIV positive, and his traumatic past left him with large scar on his neck and a few medical needs that will require lifelong care. His conditions can be well-managed with a special diet and monthly shots. Ronny is a special cat who has been through so much and would love nothing more than to join a forever family who will love and take care of him. If you’re interested in adopting Ronny, please call our Adoptions Department in New York City at (212) 876-7700 ext. 4120. To learn more about Ronny, please visit his profile page and be sure to check out the video below to see him in action!